Military vehicles, bulldozers and riot-geared police have moved into the Oceti Sakowin camp near the Standing Rock Sioux reservation in North Dakota, intended to clear out the remaining protesters against the Dakota Access Pipeline. 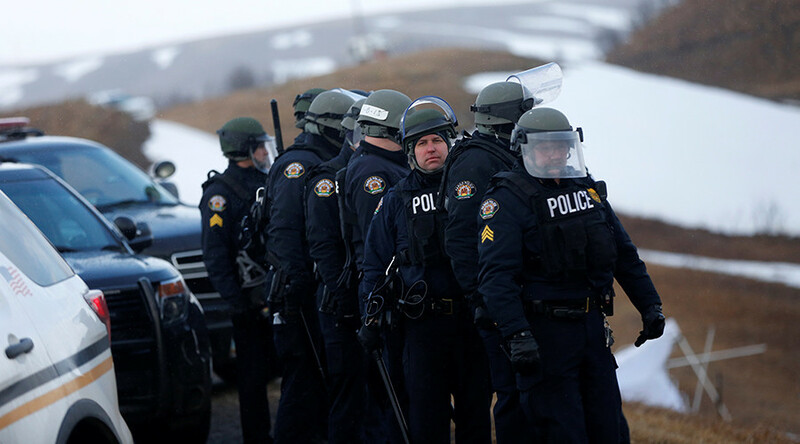 Live-streams from across the Cannon Ball River showed police, including state troopers from Wisconsin, and what looked like National Guard troops entering the mostly abandoned encampment on Thursday morning, accompanied with armored vehicles and construction equipment. About 100 protesters remained in the camp on Wednesday, defying the deadline for evacuation ordered by North Dakota's governor. Oceti Sakowin, or “Seven Council Fires,” is the native name for the Sioux nation. The protest camp was set up north of the Standing Rock Sioux reservation. The tribe has tried to stop the construction on the segment of the Dakota Access Pipeline under Lake Oahe, on grounds that it endangered their water supply. Thousands of environmental activists, Native Americans and even US military veterans have taken part in protests that began in March 2016.